Friends of AfroChicano Press is a 501(c)(3) nonprofit that creates supportive writing communities for people of all backgrounds and ages. We create spaces for people to write stories, hear stories, and tell stories. Writing circles that create local writing communities and provide spaces for regular practice. Readings where writers share their work and promote learning, community dialogue and intellectual inquiry. Writing retreats that offer inspiration, practice and networking. Dinner dialogues where participants share diverse perspectives on a single topic via a facilitated conversation over a meal. AfroChicano Press® practices a "gift economy," where the workshops, readings and retreats we offer are a gift. To sustain our work, we welcome your generous contributions. 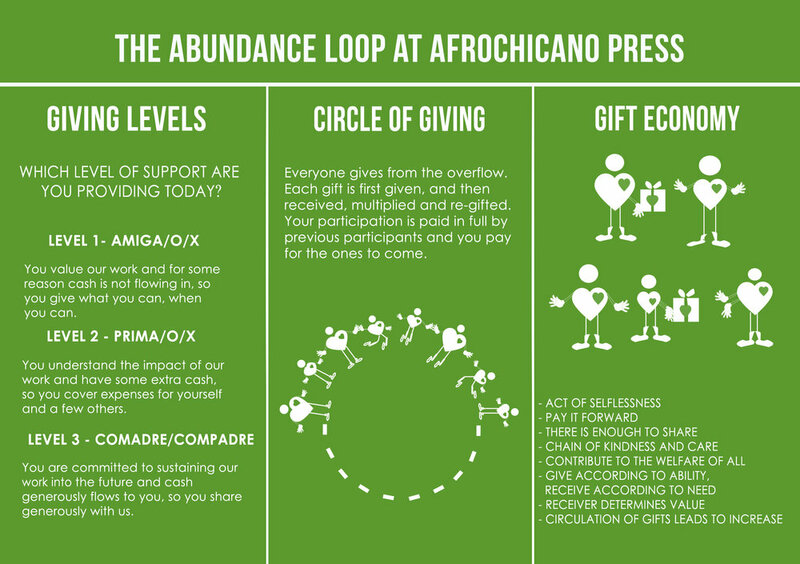 Your contributions create a circular abundance loop where AfroChicano Press can provide for others without expectation of return because we know that others are there to support us. Each person who gives participates in a growing chain of kindness and care. Your support allows us to share our programs free of charge and to remain a positive force for change in the community. Whether its $20 or $20,000, every contribution is appreciated and is put to good use. Friends of AfroChicano Press' tax ID is 82-2528646.